Excited by their academic feats, the House of Representatives, on December 6, 2017, adopted a motion, at plenary, to commend them. Consequently, Mr Abdulsalam Kamaldeen, a lawyer, 38, and Miss Aarinola Blessing Olaiya, a medical doctor, 24, are recipients of parliamentary awards. But their stories evoke tears and determination. â€¢Kamaldeen with a lawmaker at the National Assembly. He was complete from the beginning but a sickness recreated him in an odd way. But beyond the pitiable looks was a determined heart. His story evoked sympathy. He had seen frustrations and shame in his life. He had fought many mental battles but one thing kept him going: Lofty dreams. At birth, his legs were intact and strong. But at three years, he battled with polio which claimed his both legs. At four, he lost his mother, leaving him to be cared for by his grandma and indigent father. At eight, his appetite for education made him join his siblings at a primary school located within his fatherâ€™s house. But just when he thought he was like other pupils in the school, he was left in his world. Alone. While his mates, armed with their promotional results, ran home at the end of a particularly term, there was none for him even though he eagerly waited for one. At that juncture, it dawned on him that the teachers only allowed him to play with other pupils during break time to make him happy as against being isolated because of his condition. The knowledge of this reality nearly broke him. But that was one incident in 1987 that signalled the commencement of other sundry events that were later to define his life. With tears in his eyes, he returned home to ask his father to enrol him in the school. Yet again, that was one big luxury the father could not afford. His grandma also told him his request was a tall dream. They had told him even before then that school was not for him. That was evident in two issues: His condition and the familyâ€™s poverty. The development rattled him. But his determination to be educated became reinforced. And then luck smiled on him. His father, through interventions by neighbours, finally enrolled him in the school. But yet, no money. To overcome this, he took him to the streets, begging for alms. What he made from the begging saw him through primary school in Offa, Kwara State in 1993. But that was only a phase. He wasnâ€™t made yet. He was immediately admitted into Erin-Ile Secondary School. Then, again, financial challenge reared its ugly head. This time, he needed just N520 for school fee, uniform, locker and chair. The amount was too big to be realized through begging in Offa. And so, he decided to leave Kwara State. Destination: Lagos. Without knowing anybody in the nationâ€™s commercial capital, he boarded a train and disembarked at the Iddo terminus. And with the help of passers-by, he found himself at Idumota Market which later became his shop not for productsâ€™ sales but for alms begging. And so, for 12 days, he raised about N1, 900, through alms begging, out of which, on his return to Offa, he paid N520 for his admission at the Erin-Ile school. Alms begging proceeds also saw him through secondary school. And whenever he went to Lagos, in-between his secondary education, Idumota bridge was his residence. In 1999, when he was due to write the West African Senior School Certificate Examination, WASSCE, again, lack of money failed him. But he soldiered on. In 2002, he took the General Certificate of Examination, GCE, as an external candidate and made his papers. At this time, he had relocated to Lagos and rented an apartment. With his papers complete, he got admission to study political science in University of Lagos, UNILAG, in 2006. Yet no money. A journalist published his story which earned him sympathy from some Nigerians who paid his way through the university. Done with political science, he set for his dream course: Law. That was in 2010. 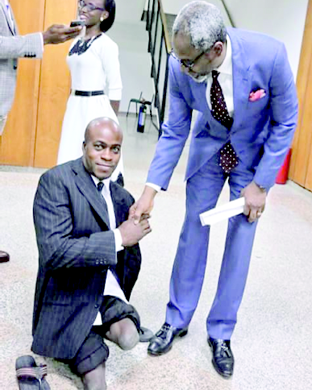 Five years after, he was through and admitted into the Nigerian Law School. In 2016, he was called to the Bar. I am a native of Erin-Ile in Oyun local government area of Kwara State. I lost my legs to polio at the age of three and lost my mother when I was four years old. My road to education was very rough because my father and my grandmother believed I couldnâ€™t cope. While all my siblings were registered in primary school, I wasnâ€™t. But I always went to play with friends in primary school and no teacher disturbed me. I thought I was a pupil like others. But it happened one day when all students were promoted to primary one and I wasnâ€™t promoted and I demanded explanation. I was told that I wasnâ€™t a pupil but merely allowed to play with others because of my condition. I was very bitter. I went home and demanded that my father must register me but he refused. I started crying and calling neighbours and it yielded result as many came out and told him to register me. My grandma said there was no way my father could finance my education with his meagre income and I said they should just register me and forget the rest. They did just that. I resorted to street-begging in that week of registration to buy books and uniform (that was in 1987 when I was just eight years old). I begged for alms at Offa and Erin-Ile, which is my place of birth, throughout my primary school. I was admitted into Erin-Ile Secondary School immediately after my primary education in 1993. I needed N520 for school fee, uniform, locker and chair. I could not realize this amount through begging in Offa at that time, but I found that people always say there was money in Lagos. So I joined a train one afternoon in Offa for Lagos. Since I knew no one in Lagos at that time, I decided to come down at the trainâ€™s final stop. And that place happened to be the Iddo terminus. I came down, went round the terminus and asked people about the environment. Some who cared advised me to go and beg for alms at Idumota Market which I did and I was able to raise about N1, 900 after 12 days of begging out of which I paid N520. And whenever I needed money, I came to Lagos and took refuge under the Idumota bridge. I did that throughout my secondary school. I couldnâ€™t write WASSCE in 1999 because I could not raise the money early enough. I finally relocated to Lagos in 1999 and rented a room after six months of begging. I wrote GCE in 2002 and cleared it. I got admission to study political science in University of Lagos, UNILAG in 2006 and I almost missed the admission due to lack of financial power. I came across a journalist who published my story and people came to my rescue and that is how I finished my first degree. But my first degree was not the original course I wanted to study, it was my second choice. I wrote another WASSCE and JAMB while preparing for my final exam in political science and passed. I was admitted to study law the very year I finished political science (2010). I finished law in 2015 and went to Law School the same year and I was called to the Bar in 2016. Now I am facing two major challenges one of which is mobility. Commercial vehicle operators donâ€™t like to carry wheelchair users because they believe it disturbs their work. I desperately need a car (not necessarily a new car). The second problem is job. I am jobless, currently. I prefer to establish my own chambers because it will give me job security as no one can sack or retire me. I know that it is always difficult to get clients into new chambers but it is better to start early and, within three years, the chambers would be recognized and the benefits are forever. I prefer this to paid employment. But in the absence of self-employment, I will do anything that comes. One of my worst experiences is that when I was sleeping under the bridge after begging for alms in day time, some soldiers who were members of Operation Sweep will come in the night, arrest us, collect our money and drop us along the road in the middle of the night. Again, being seen as a beggar is what I hate most because it reduces one to a nonentity. There is no magic than to focus and be determined to get out of begging which dehumanises you. I wish to end my law career as a judge or a senior advocate. (The inspiring story of Aarinola Olaiya Blessing runs next week). The post I begged for alms on Lagos streets to raise N520 school fees â€“ Kamaldeen, lawyer appeared first on Vanguard News.